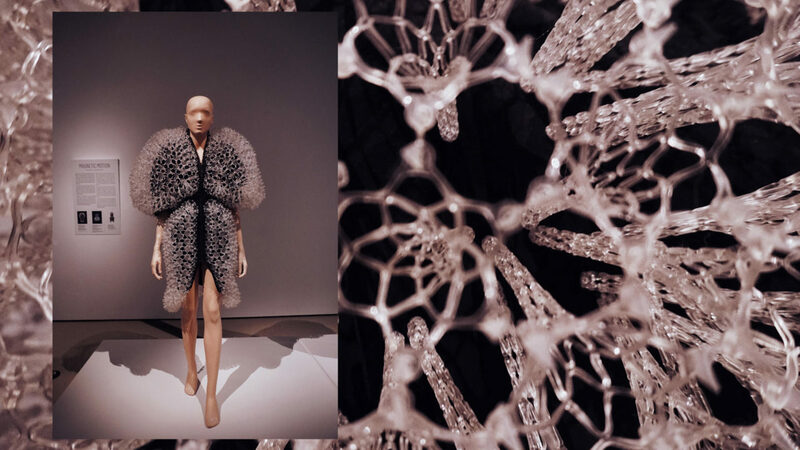 The newest exhibition Iris van Herpen: Transforming Fashion in concert with Philip Beesley: Transforming Space at Royal Ontario Museum goes beyond fashion and explores the endless possibilities that come from interweaving design, art, and technology. Van Herpen’s 2008-2015 collections are highly visual and extraordinary designs as they push the boundaries of traditional fashion and craftsmanship. The Dome dress was inspired by air and designed with innovative materials to produce an intricate silhouette that floats around the body like a wondrous silver cloud. Made in collaboration with Philip Beesley, this incredibly light dress was created using delicate and voluminous laser-cut metal lace that was then hand-molded into three-dimensional domes. 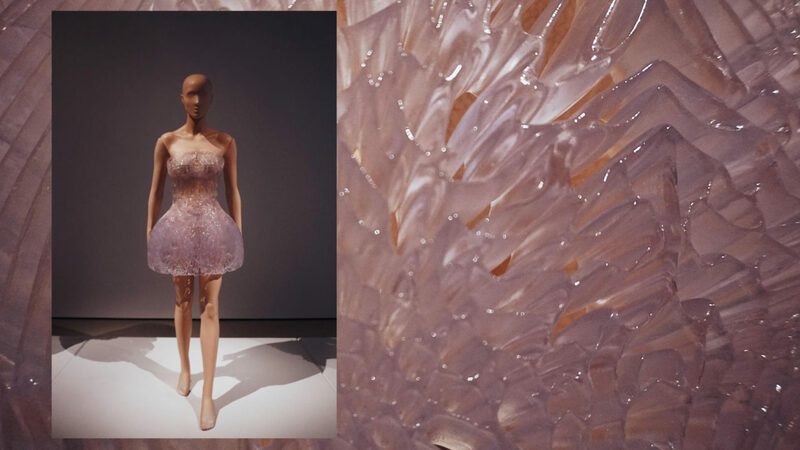 With nature as van Herpen’s other muse, the rose-like domes mimic bubbles of air reflecting light and billowing around the body, producing the airy, weightless movement of the Dome dress. Iris van Herpen explores the body’s electricity in her Voltage collection. The work of New Zealand experimentalist Carlos Van Camp, who choreographs with extremely high-voltage instruments (Tesla coils) that interact through the movements of the performer, played an important part in the evolution of this collection. 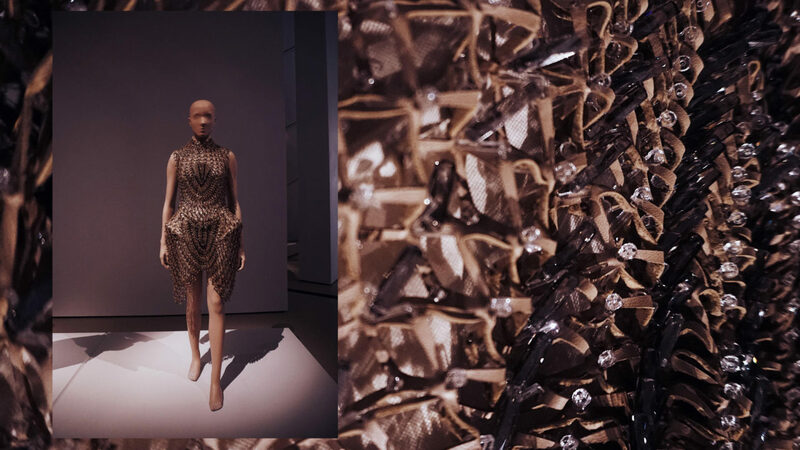 Van Herpen used cutting-edge technologies to create pieces that evoke both beauty and danger. Her designs seek to portray the unpredictable movement and transformative power of electricity. 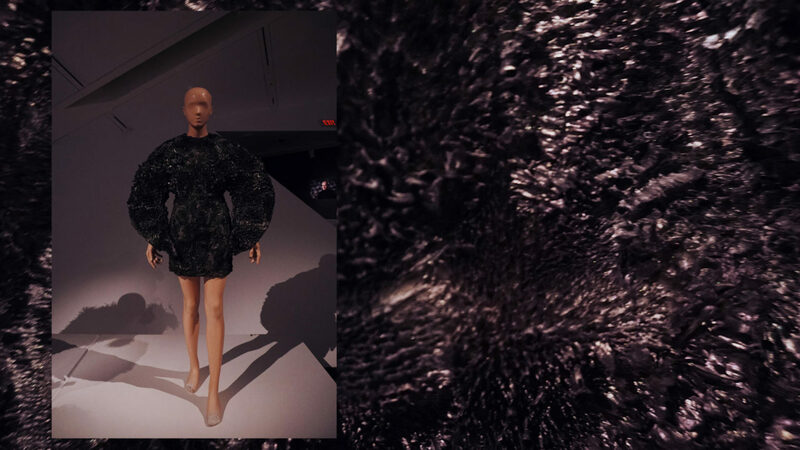 Described as taking an alchemist’s approach to fashion, van Herpen perpetually embraces new collaborations with artists, architects, and researchers, using their since with her own vision. Van Herper shares Canadian architect and artist Philip Beesley’s fascination with new materials and has established an ongoing collaboration with him to imagine designs that react to the energies of their environment. Interested in the ways that chemistry and electricity can cause structures to change form, the pair developed several 3-D fabrics that respond to the wearer’s body movements through dynamic vibration. 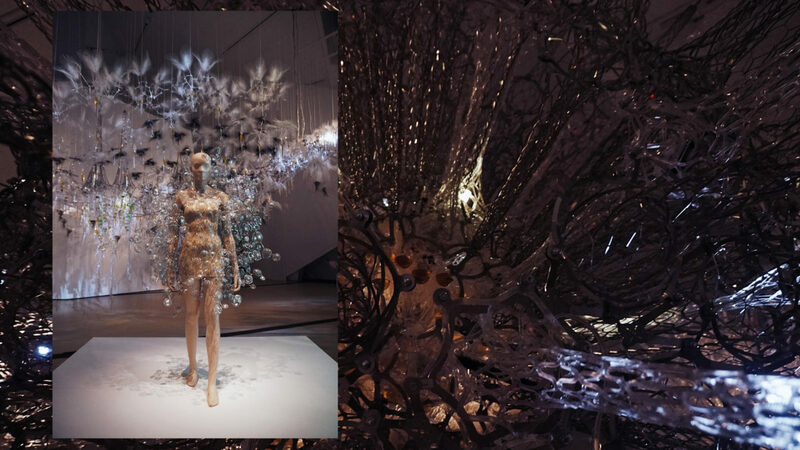 Toronto-based architect and artist Philip Beesley’s work Hylozoic Ground provided the inspiration for van Herpen’s collection Hybrid Holism. Hylozoism is the ancient belief that all matter is in some sense alive. Drawing from this idea, Beesley’s seemingly living environment breathes, shifts, and moves in response to the people walking through it, touching it, and sensing it. He incorporated microprocessors to give the environment a primitive or insect-like intelligence like that of a coral reef or a great swarm. 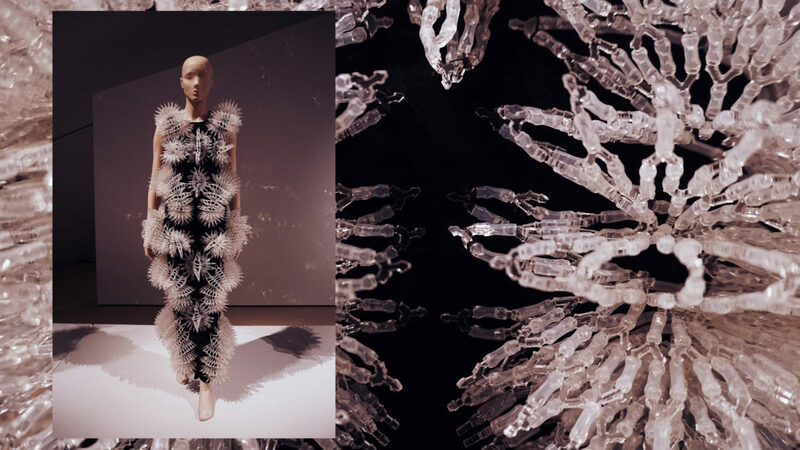 Intrigued by the possibility of constructing semi-living systems, van Herpen imagines a new form of fashion where designs can grow, evolve, and even exist independently from us. 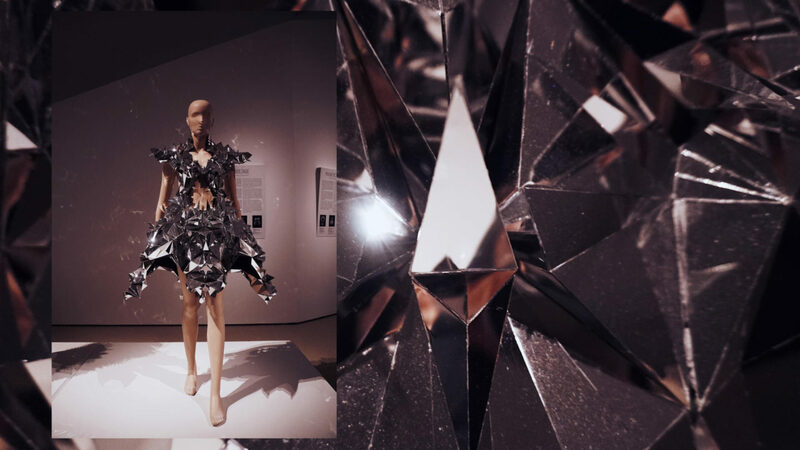 In a culture, where obsolete designs are often discarded, van Herpen proposed that clothes and objects might instead evolve and transform over timr. Combining diligent craftsmanship with cutting-edge technology, including 3-D printing, van Herpen translated the futuristic vision into a collection that is highly complex and diverse in terms of shape, structure and material. Van Herper’s layered, three-dimensional structures (that combine innovative technique like 3-D printing with intricate handwork) explore the dynamic forces of attraction and repulsion. 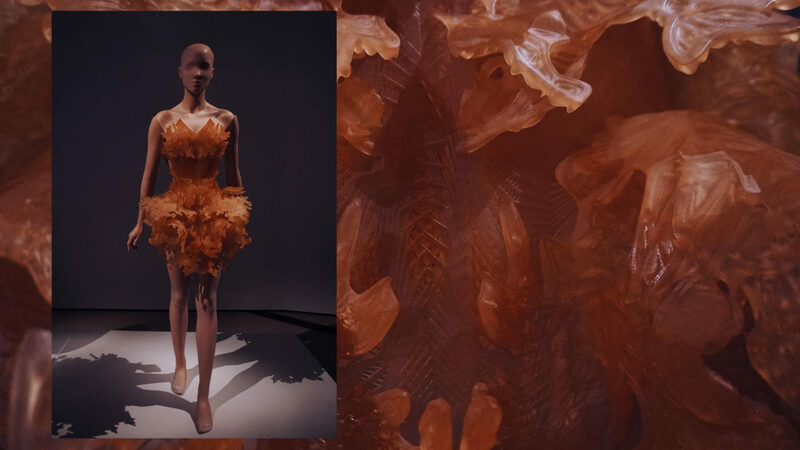 Van Herpen collaborated with Beesley to create luminous, three-dimensional textiles comprising tiny webs of laser-cut acrylic that echo the body’s movement. Throughout the collection, the clothes’ controlled structure, such as that of a crystalline 3-D-printed dress, is offset by accessories with individualized, even chaotic, forms. Van Herpen and artist Jólan van der Wiel created a series of shoes using the same techniques involving magnetic fields that they had used in their collaboration of Wilderness Embodied. The powerful, unbridled forces of nature were the starting point for Wilderness Embodied. This collection explores instances in which the wild forces of the natural world are manifested in, or on, the body. 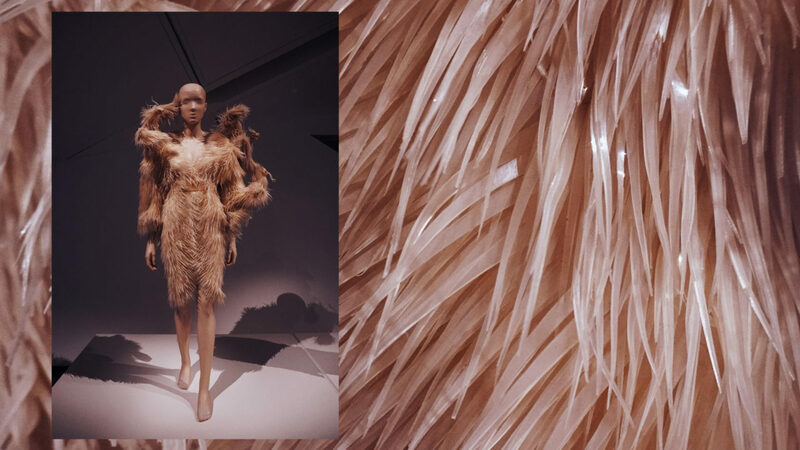 Van Herpen sees the ritual and transformative qualities of piercing, scarification and surgery as examples that emphasize the wild(er)ness of the human for. 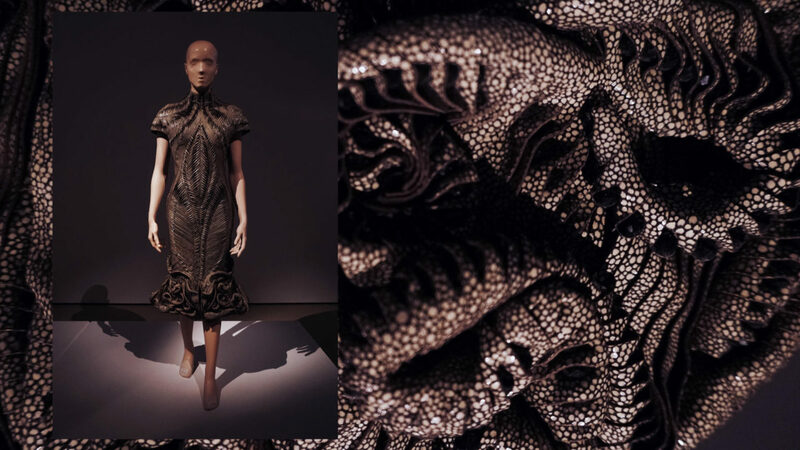 Juxtaposing, traditional craftsmanship with technological innovation, van Herpen’s designs evoke complex natural forms that appear to emerge from and ever overtake the body. Montreal-born artist David Altmejd, whose hybrid humanoid figures and environments echo van Herpen’s interest in fusing nature and culture, was important inspiration for her designs. For this collection, van Herpen collaborated with Dutch artist Jólan van der Wiel, who incorporates unorthodox materials and techniques that bring the forced of nature into his designs. His use of magnets to “grow” a series of Gravity Stools inspired the two designers to create dresses with created topography generated by the play between attraction and repulsion. In an era when it is possible to purchase patents on our genes, the boundaries between private and public are growing increasingly porous. 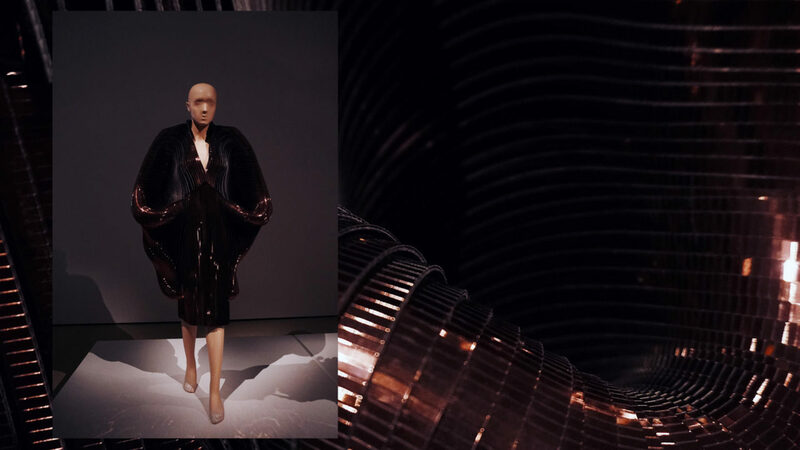 Iris van Herpen’s Biopiracy collection explored physical integrity, individuality, and autonomy – asking the fundamental question: are we still the sole properties of our bodies? 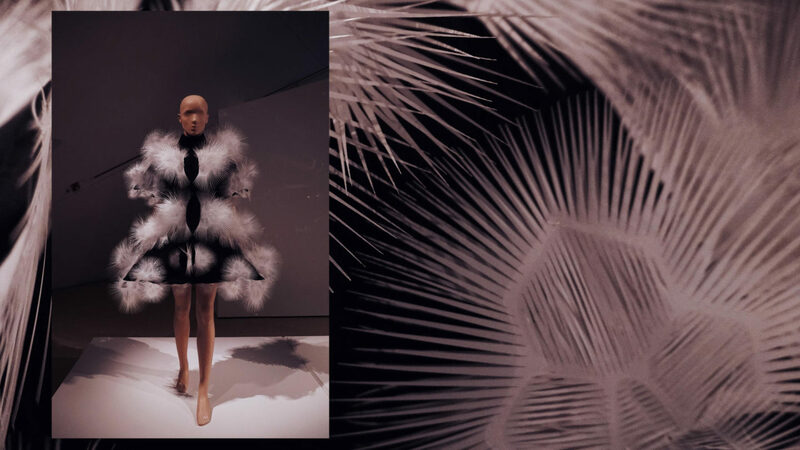 Working with artist Lawrence Malstaf, who specializes in the interaction between biology and physicality, van Herpen created on of the most shocking runway shows. Models, vacuum-packed between layers of transparent PVC, appear embryonic as they float in a meditative suspended animation. Precious elements, embedded and partially hidden, lend individuality and sumptuousness to the collection. 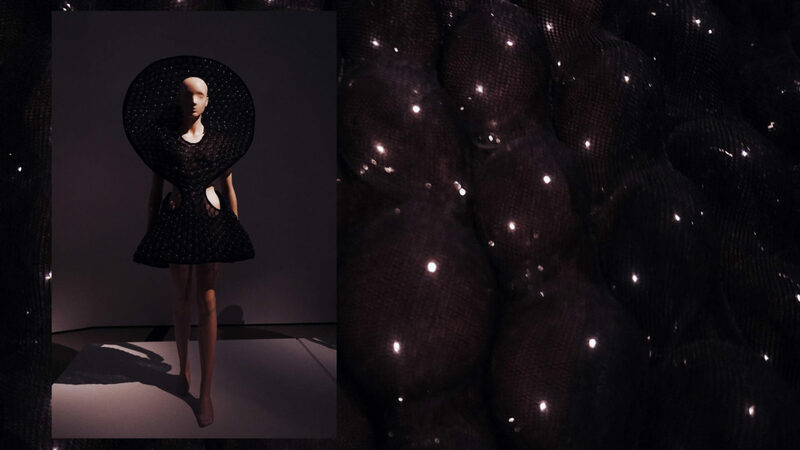 A translucent black halo dress made of handglown glass balss radiates like a halo around the body. Another dress made in collaboration with Julia Koerner gives the impression of kinetic energy. The fusion of the artisanal with the technical resulted in a 3-D-printed dress that seems to dance and amplify the wearer’s movement. After it was printed, the dress was coated with silicone to create a supple finish. Previous Post Beauty // x Avène / How To Help Your Tired & Sensitive Skin?